I like Avon's men's fragrances, but I have to admit that too many of their releases during the past few years have been uninspiring. That is, too many of them follow the woody/spicy/violet leaf road that's been tread way too many times by others during the past five or six years. 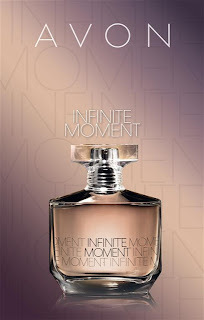 Infinite Moment, thankfully, is nothing of the sort, and is a fairly unique spicy oriental fragrance. I say "fairly" unique because no one in his right mind looks to Avon for innovation, especially when you consider how low their prices are; "research and development" certainly isn't factored into Avon's pricing. Any of you who are familiar with the great but discontinued Zino Davidoff from 1989 will have an idea of what Infinite Moment smells like. This is a dark, spicy oriental, with a unique core accord that smells at once aromatic, woody and darkly floral; Zino acheived the same effect with heavy use of patchouli (the aromatic), rosewood (the woody) and rose (the dark floral). I don't know what the ingredients are in Infinite Moment, but the effect is basically the same. There are differences between the two scents, obviously. What stands out first is that Infinite Moment is sweeter than Zino, with an underlying Joop Homme/lipstick-like sweet smell that, surprisingly, works well and makes it unique. I really like this added touch. On the negative side, Infinite Moment is nowhere nearly as well blended as Zino; compared to Zino, Infinite Moment smells crude and rough. I also suspect that Infinite Moment contains a higher percentage of synthetic ingredients. However, don't take that as a huge criticism, since this is a very wearable fragrance. Because of its dark and spicy aroma, Infinite Moment seems especially appropriate for wearing on a night out. Overall I'm pleased with this purchase. You can't beat Avon's prices, and this is one of the better Avon fragrances I've tried in a while. It's not perfect - longevity could be better - but it's a very nice, fairly luxurious fragrance that doesn't smell like what every other guy is wearing. It's got a cheap price, but no one will think you're wearing a cheap cologne, trust me. That's interesting you say this resembles Zino. I feel Mesmerize strongly resembles Zino as well. Now I really want to grab a bottle of this, too. But it does beg the question, for the Zino effect, why not just wear Zino? With Mesmerize I think I actually like Avon's interpretation of this sort of fougere better, because they fused an oriental accord to the structure and brightened it up with apple and citrus notes. I bought Mesmerize because a co-worker of mine became an Avon rep, and I wanted to help her out (at the time I absolutely had no interest in purchasing an Avon fragrance). I'm glad I contributed $20 to her cause, because Mesmerize is astonishingly good imo. Glad to see Infinite Moment carries on that trend. I've only smelled Mesmerize once, and I really liked it. I think I thought of it as a milky, powdery oriental that reminded me of a much lighter, less oppressive Le Male. I'd have to try it again to see if I notice the similarity to Zino. Mesmerize is one of those frags I pass over in the Avon catalogue, knowing that I'll eventually get it. I've always taken for granted that Avon still makes it. Watch them dc it before I buy a bottle.